“This was his Georgia” Historical Marker – What will matter in a hundred years? My sister had all of our family’s old 8mm home movies digitized. One of the early videos, from the early 1960s, opened on a historical marker, shown below in a screen capture from the video. This apparently was an earlier version of the more recent “This was his Georgia” marker in Harris County at the FDR overlook & favorite picnic spot. I am fairly certain this was from the same location on Dowdell Knob. 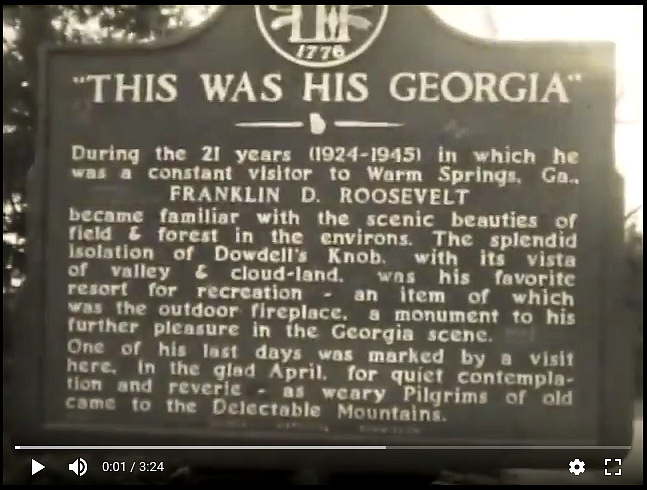 During the 21 years (1924-1945) in which he was a constant visitor to Warm Springs, Ga., FRANKLIN D. ROOSEVELT became familiar with the scenic beauties of field & forest in the environs. The splendid isolation of Dowdell’s Knob, with its vista of valley & cloud-land, was his favorite resort for recreation – an item of which was the outdoor fireplace, a monument to his further pleasure in the Georgia scene.